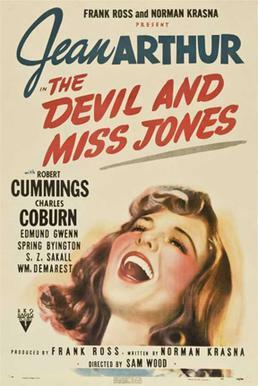 The Devil and Miss Jones not to be confused with a similar named famous adult film helped changed my outlook on life. For anyone who likes movies and old vintage films then you will love this full length feature. I am telling you that you should pop popcorn tonight and curl up somewhere and treat yourself to old Hollywood. This is one of my favorite films and hopefully you will appreciate the film and the music from an era gone by. Jean Arthur is one of those characters that you wish were your friend and gives a great performance. The Devil and Miss Jones is a 1941 comedy film starring Jean Arthur and Charles Coburn. Directed by Sam Wood and scripted by Norman Krasna, the film was the product of an independent collaboration between Krasna and producer Frank Ross (Jean Arthur’s husband). Their short-lived production company released two films through RKO Radio Pictures (Miss Jones and 1943’s A Lady Takes a Chance). The film was well received by critics upon its release and garnered Academy Award nominations for Coburn and Krasna.